The Buckeye State gets a bad rap because it’s a Midwestern state in the sleepy bread basket of the nation. Believe it or not, Ohio is the seventh most-populous state in the country, with three large metropolitan cities surrounded by vibrant rural communities in every direction. I like looking at Ohio when I talk about gambling law, because Ohio is the most-recent state to make a major change to its gaming legislation. In 2012, casinos were legalized and began to shoot up all over the state. Today, the state is home to seven racinos and four legitimate land-based casinos, with more on the way. This is no wimpy video poker and slot law, either – nearly unrestricted numbers of table games and live poker tables are also legal. But one betting option still not available to gamblers – bets on sports. The seven racinos are all home to simulcast race betting, showing events from tracks all over the United States. But they stop short at OTB windows, electronic bingo, and video poker. Nowhere in Ohio is it legal for you to place a live bet on sports. 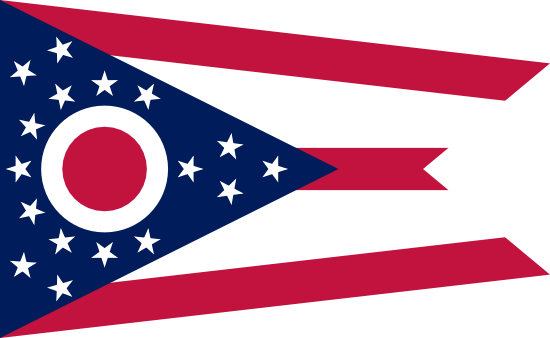 Let’s look at the state of Ohio and its gambling laws a little more closely, especially as they pertain to sportsbook gambling. The three biggest cities in Ohio are Cleveland, Columbus, and Cincinnati, each of which plays host to at least one major sports team. Ohio can boast of hosting a pro team from every major US sport – baseball, basketball, football, soccer, and hockey. Ohio teams are traditionally pretty good, too – pro squads from the state have won 7 MLB World Series, 9 NFL Championships, and an MLS Cup. The state is also a traditional home of both baseball and football, home to MLB’s first fully-professional team, the Cincinnati Red Stockings, and the predecessor to the NFL called The Ohio League. Today, you can find the Pro Football Hall of Fame in Canton, Ohio. The Reds have won five World Series titles and are consistently competitive in the NL Central division. The Indians have taken home two World Series titles but have slipped into mediocrity over the past few decades, having won their division just two times since their brief late 90s divisional dominance. The Bengals are one of thirteen NFL teams that have never won a title. They’ve fared much better since a move to the AFC North, taking home three divisional titles in the past decade. The Browns are Ohio’s more-storied NFL team, with four Super Bowl titles to their credit. Unfortunately, they haven’t won their division since Reagan was in the White House. The Browns have been in the playoffs twice in the past twenty-five years, both of those wild card appearances. Three of the Cav’s four divisional titles and both of their conference championships came during one of Lebron James’ two stints with the team. His impact on the league, the state of Ohio, and the city of Cleveland can’t be overstated. Though James has yet to win a title with Cleveland, he’s the biggest story in town, and probably will be for some time. The Blue Jackets were added to the NHL as an expansion team in the year 2000. Columbus is considered the NHL’s legitimate cellar-dweller, with zero league, conference, or divisional titles to its credit. In fact, Columbus has only reached the playoffs once, in 2009, losing its first series in a near-sweep. The Crew are one of the ten original MLS clubs, and has plenty to brag about. Columbus won the 2008 MLS Cup, and have qualified for the CONCACAF Champions’ League three times, reaching the semi-finals each time. Though Ohio has a bustling pro sports scene, the state is also in thrall with high school and (naturally) collegiate athletics. Unlike some nearby states (we’re looking at you, Indiana), Ohio is a true three-sport state, with excellence in college basketball, college football, and NCAA baseball. The standout school from this list is Ohio State. The Buckeyes’ fans are the loudest and most visible of the state’s many collegiate sports fanatics, in part because the team has had so much success in NCAA athletics. Ohio State is one of just five NCAA schools to win titles in football, basketball, and baseball. The Buckeyes are consistently ranked in the top 10 in the Athletic Director’s Cup, an indication of the school’s dominance across the board of NCAA athletics. Ohio law is pretty liberal when it comes to gambling – the state allows for legal bets on horse racing, satellite racing, and tribal gambling, not to mention social and charitable games and a popular lottery system. Having said that, if you were to be charged with a gambling crime in the state, you’d be in some pretty bad trouble. If you’re busted in Ohio for an offense of simple gambling, you’ll face a first-degree misdemeanor, which means a fine of $1,000 or more for a first offense. A second offense is a felony charge. So how does the state define gambling? Pretty rigidly, it turns out. According to the state criminal code, gambling is any act of “… bookmaking; facilitating schemes or games of chance for profit; betting on schemes or games of chance for one’s livelihood; possession of gambling devices; or playing craps, roulette , or slot machines for money.” That’s a really odd way to define gambling, but it doesn’t leave much room for error. Remember that I am NOT a lawyer, I’m just a guy who likes to write about gambling law, and you shouldn’t take anything I say in this or any article I write as legal advice. Talk to a real lawyer about your Ohio sports betting questions if you are truly concerned about staying on the right side of the law. The state of Ohio is not anti-gaming by any means. The state is already home to more than a dozen facilities offering some form of legal wagering, with more on the way. The fact that you can’t place a legal sports bet anywhere in the Buckeye State is more a symptom of American gaming law than any Ohio legislation. The easiest way to bet on sports if you live in Ohio is to take a trip to Las Vegas. Otherwise, consider joining an online sportsbook, provided it is legal for you to do so.